Fashionistas will love the Prada, and the technophile won't hate it either - it's unlikely to be a break out hit, but a decent effort nonetheless. LG and Prada have history. Back in 2007 the pair got together and spawned a mobile phone called, well, the LG Prada. Two years later, there was a second outing, in the shape of the LG KF900 Prada. 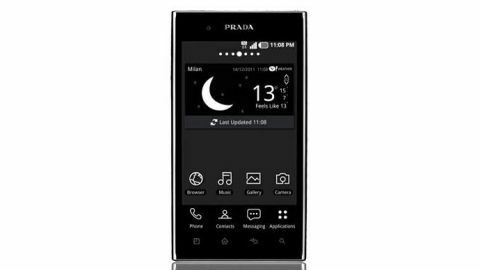 Almost like clockwork - albeit a rather slow clock - two years later and we have a third LG Prada handset, the PRADA Phone by LG 3.0. We know, the name PRADA Phone by LG 3.0 doesn't really trip off the tongue, does it? We're going to call it the LG Prada 3.0 like, we suspect, most will do. Obviously, the LG Prada 3.0 has a lot of emphasis on stylish hardware design. There's also a rather nifty interface skin that's been applied to Android 2.3, and the general specs aren't too shabby either. At first glance, this is a handset that ticks a lot of boxes. Dig deep, and we find there is a little bit of style over substance creeping in. But we'll come to that. The Prada Phone by LG 3.0 is a big, really neatly designed handset. With a 4.3-inch screen and seriously big top and bottom screen bezels, this is a sizable phone for your pocket. Most people will have trouble reaching across the screen for one-handed use. The all-black front hides four application shortcut buttons that are briefly lit up when you press the area below the screen. It's one of two usability annoyances that these buttons don't stay backlit for very long. You have to remember their order - Menu, Home, Back, Search, if you are to get what you want with a single screen tap. It might take you a little while to do this. The other annoyance is that the very, very stylish on/off button on the top of the chassis is a bit of a fiddle to use. It's a small, round affair, on the far-right of the top edge. It's not marked with an icon, and there's another identical button that launches the camera app and takes photos and videos. That lack of marking isn't really what irritates us, though. It's that the buttons are both a bit small and sit flush to the chassis. You have to press rather hard to activate them, and they're not that easy to locate by touch. The top edge is also the location of the USB connector and headset connector. The former has a sliding cover that we really do like. It protects the connector from dust and just looks very cool. LG has played the minimalist game as far as the rest of the edges are concerned, with a couple of teensy volume buttons on the left-hand edge - again very small and flush to the chassis, and absolutely clean bottom and right edges. This is significant, because the LG Prada 3.0 is super, super thin. At just 8.5mm thick, it looks every inch the starved catwalk model, except that in this case the slimness is good. For a handset measuring 127.5 x 69 x 8.5mm, that thinness really stands out. The other thing that stands out is the leather-like patterning to the backplate - Prada's Saffiano pattern, although it's clearly made from plastic here, and possibly isn't quite able to deliver the sleekness Prada was looking for. Still, it's a design that's distinctive, and it helps with grip. We're not sure we need both LG and Prada logos on the back though, and the latter looks particularly OTT since it's also on the front above the screen. There's quite a lot to like on the specs front, with a 1GHz dual core processor supported by 1GB of RAM, 8GB of user storage and a microSD card, 8 megapixel main camera and 1 megapixel front camera, Wi-Fi, Bluetooth, GPS, DLNA, NFC, that tweaked user interface and a fair range of add-on applications to get your teeth into. For a UK price of around £430 and costing around $650 in the US, we think a faster processor might have been preferred, and an HDMI output would not have gone amiss either. But all in all, it looks like there's a lot to sink your teeth into here.